Little late on this, but I hope you'll check out our multiple features on the legacy of Cardinal Avery Dulles. First, in the November 29 issue, Jeffrey Gros reviewed the new biography of Cardinal Dulles by Patrick W. Carey. We have also reprinted several articles Cardinal Dulles wrote for America. A selection is available here. Finally, in my November 29 podcast dicussion with Fr. Mark Massa, Fr. 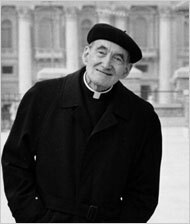 Massa assessed the theological legacy of Cardinal Dulles. Scroll to minute 15:50. Despite all the acclaim Cardinal Dulles has received, sometimes I think he is under-rated and even under-appreciated. Perhaps because he is familiar to many of us? That beret and jaunty chin gliding across the quad in front of Keating Hall?